The Forks Senior Center operates a vibrant program in a spacious and convenient location in the Calhoun County Human Services Building at 101 N. Albion Street (view map). Activities involve a wide selection of programs and services geared for seniors to promote healthy lifestyles. Yearly membership dues are modest and include full use of the Fitness Center. Scholarships are available for those who qualify. Used for many of the socialization activities, it also offers a computer with internet access as well as a member book and magazine exchange. The purpose of this group is to increase center participation among members, provide socialization, and gain input from seniors within the community on additional programming. The club meets monthly and includes breakfast meetings at the Center as well as morning off-site trips that include breakfast. Every month a group of FSC members share their culinary skills and enjoy sampling each other’s recipes. Recipes range from appetizers to main course meals that are healthy and easy to make. Copies of the recipes are passed out to club members. Lead by a facilitator from Senior Health Partners who brings in monthly speakers to help members understand how to deal with diabetes. 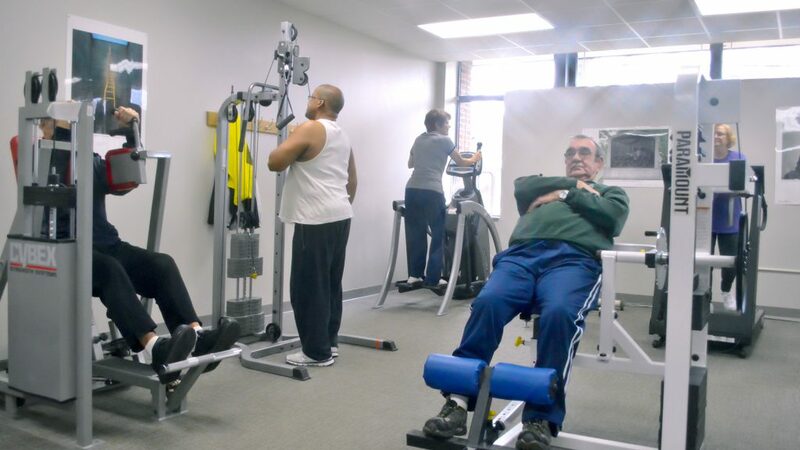 The Center is committed to enhancing the quality of life of all its members. Recreation and education programs are offered to meet the needs and desires of current members and attract new members by broadening the type offered. A variety of innovative new programs are contunjually being tested to stimulate members’ minds and engage members by sharing skills and interests. Members and community members teach the classes. A fully equipped exercise room is available and open during center hours. Senior Health Partners provide trained nurses who check blood pressure, blood sugar, and pulse-oxygen levels weekly. Individualized foot care is available by appointment. Monthly potluck dinners as well as Bridge (once a week), Bingo (twice a week), Euchre (twice a week), Ping Pong (twice a week), and board games provide an important outlet for socialization. Presentations are scheduled monthly to provide educational programs on a wide range of health and wellness topics. Area health care professionals from Oaklawn Hospital, Bronson Battle Creek, and Oaklawn Rehabilitation Center share their knowledge monthly with members and non-members. Beginning on October 15 through early December, the Forks Senior Center sponsors a Medicare Part D assistance program. Appointments are taken Monday through Thursday for individual help to choose the best suited Medicare Part D prescription plan. A certified Mediacare/Medicaid Assistance Program specialist provides the appointments. Throughout the year, appointments are taken for Wednesday and Friday mornings from 9:00 am to 12:00 pm for assistance with any Medicare/Medicaid questions. We are always looking for new topics and instructors to teach workshops. If there is something you want, let us know. This class provides wellness education, strength exercises, and balance training. It is offered twice weekly on Tuesday at 1:00 pm and Thursday at 11:00 am. Silver Sneakers is an innovative health, exercise, and wellness program helping older adults live healthy, active lifestyles. This is a national program funded by certain insurance plans. A knitting and crochet guild meets once a week to share talents and love of handwork. During the summer, hand knit baby items are designed for donations to the annual Healthy Babies Day held in Albion. Throughout the year, trips to museums, sporting events, casinos, theatres, parks, and outdoor activities are planned for members and non-members. These popular trips allow for area senior citizens to enjoy companionship and safety traveling in a group.